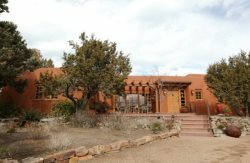 Located in the historic Eastside of Santa Fe, just one block from the galleries, restaurants and boutiques of Canyon Road, this new adobe home is one bedroom plus media room main house and a small one bedroom adjoining casita. The master bedroom has an en suite bath. The gourmet kitchen opens onto the dining room and living room. Just off of the kitchen, there is a large BBQ. Downstairs there is a room with flat-screen TV as well as couch that can be converted into a bed. The room has low ceilings and would be an ideal media room for kids. There is a full bathroom downstairs as well. Central heat and air conditioning make the home a great vacation rental no matter what the season. comfortable. The main house shares a patio with a built-in BBQ grill, outdoor fireplace and dining table and chairs with the one bedroom, one bathroom casita. The casita may also be leased as a one bedroom for $300/night. Approximately 1,200 net square feet. They are all very friendly and tried extremely hard to make sure everything was in place and ready for our stay. We enjoyed our stay at Dos Truchas and appreciate the Casas De Santa Fe staff for their hospitality. A wonderful little hideaway within walking distance of the square. Well appointed, clean and charming. It was great. I particularly enjoyed the outside Kiva fireplace. I was very, very satisfied with service, friendliness of staff, condo, area. We just really really enjoyed our family time together in this cozy place.